Jury Selection Set To Begin In Charleston, S.C., Church Shooting Trial Of Dylann Roof : The Two-Way Federal prosecutors are seeking the death penalty for Dylann Roof, 22, who killed nine people during a bible study at Emanuel AME church in Charleston, S.C. in June 2015. 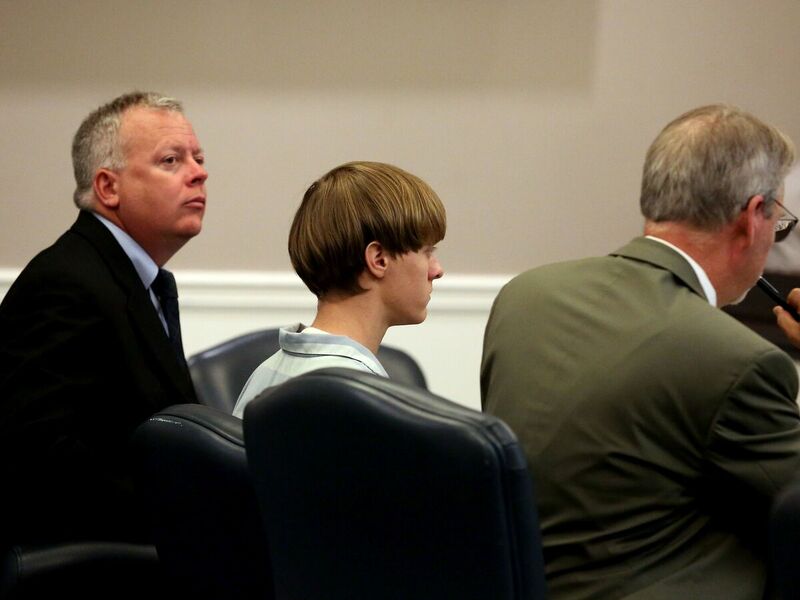 Dylann Roof appears with lawyers Bill McGuire and Chief Public Defender Ashley Pennington at a court hearing in Charleston, S.C., on July 16, 2015. Jury selection begins Monday in the trial of 22-year-old Dylann Roof for the alleged murder of nine people at a historically black church in downtown Charleston, S.C. in 2015. The Charleston Post and Courier reported the 12 jurors will be chosen from a pool of more than 700 people, and the jury selection process "is expected to take weeks." The U.S. Justice Department is seeking the death penalty for Roof, who faces 33 federal hate crime charges. Roof is pleading not guilty. The trial of Roof will take place across the street from another racially-charged trial set to resume Monday in Charleston. Former Charleston police officer Michael Slager is accused of murder for the 2015 shooting of Walter Scott, an unarmed black man, in North Charleston. The jury in that case heard opening arguments last week. Dylann Roof is accused of opening fire at a Wednesday-evening bible study group at the church on June 17, 2015. The church's reverend, Clementa Pinckney, was among the nine people who died. President Obama delivered a eulogy at a memorial service for Pinckney, who was also a South Carolina state senator. "Blinded by hatred, the alleged killer could not see the grace surrounding him," the president said in his eulogy. Relatives of Roof told the Post and Courier last week they are "still in anguish and shock that a member of our family could have committed such a terrible, senseless crime" and are "still struggling to understand why Dylann caused so much grief and pain to so many good people." Roof faces separate murder charges brought by the state of South Carolina, which is also seeking the death penalty. The state trial is set to begin in January. Both the federal and state charges include weapons offenses. The FBI said Roof should not have been allowed to purchase a handgun because he had previously "admitted to possessing a controlled substance." "Comey said flaws in paperwork and communication between a federal background check worker and state law enforcement allowed Dylann Roof to buy a handgun in South Carolina on April 16 — weeks before he allegedly attacked black churchgoers in a failed attempt to fuel a race war. "Comey said he had ordered an internal review of FBI policies and procedures surrounding background checks for weapons purchases." Families of the victims in the shooting are suing the FBI for negligence for the agency's failure to prevent Roof from buying the weapon. In October, the FBI filed a motion to dismiss the lawsuit on the grounds that the FBI did not have the authority to prevent the sale.